Hibs head coach Alan Stubbs has revealed the search for new faces is continuing with a raft of trialists expected at the Capital club’s East Mains training centre over the next few weeks. Although Mark Oxley has become the latest to commit to a new contract, Stubbs admitted he’s determined to add another goalkeeper to his squad having spent half of last season with only the inexperienced Kleton Perntreou as back-up to the on-loan Hull City player. 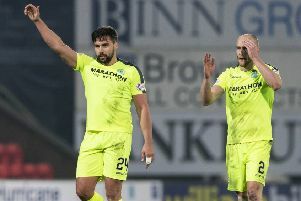 However, while Celtic have triggered the season’s option on McGeouch’s contract, Stubbs admitted he’ll be keeping tabs on the 22-year-old, who made 26 appearances for Hibs during his season-long loan spell.